One of the big challenges facing the horticultural industry is securing sufficient labour, something the forums will be addressing. “Brexit is not going to change the fact that fruit growers need an expansive labour force, but it will pose the issue of where this will be sourced from,” adds Mr Day. Though research is ongoing to find a mechanised alternative, like soft robotics to perform delicate tasks, this is not yet developed enough. “Suitably quick, effective and efficient designs are still a number of years off for mainstream use,” adds Miss Gray. Chaired by Hayley Cambell-Gibbons, NFU chief horticultural adviser, the first Fruit Forum on securing sufficient labour will start at 10am, with speakers including Amy Gray and Concordia chief executive Stephanie Maurel. Along related lines, the second forum will take a look at horticulture in a post-CAP landscape. “Brexit is arguably the biggest political transformation that growers are likely to experience, and the NFU will have a big part to play in getting the best deal for its members,” says Miss Gray. 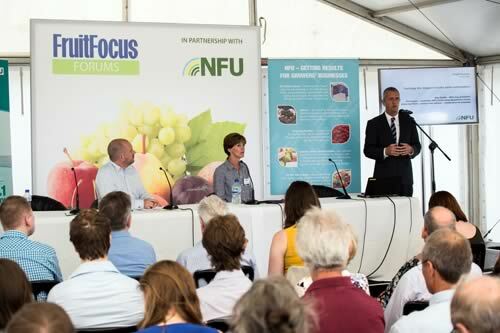 The second forum will begin at 11am and will be chaired by Hayley Campbell-Gibbons, with contributions from Tom Keen, the NFU’s EU exit and international trade adviser and Chris Hartfield, NFU senior plant health adviser.